Well known for its expertise in Austria for a number of years, Wiener Privatklinik is increasingly becoming a first choice for patients coming from abroad. “We are very proud that the international patients have recognized what we represent and that we have gained their trust”, says Primarius Walter Ebm. 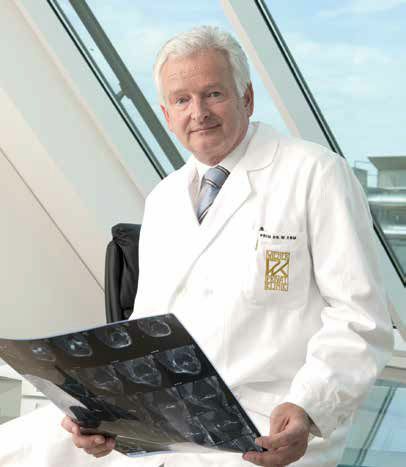 ”The patients at Wiener Privatklinik are treated with the best and latest methods”, Dr Ebm adds. How has the expertise of the Wiener Privatklinik (WPK) evolved since its establishment? — We at WPK are working continuously on developing every aspect of the clinic. Our main focus is on patients and providing our patients with the outstanding care which, at the same time, means providing our affiliated physicians with optimal working conditions, the top notch technology and modern, constantly improved hospital management. All of this combined results in quality on the highest level. Our clinic has 145 clinical beds, 4 state-of-the-art theatres, advanced radiology centre and more than 300 remarkable doctors. Our proximity to the Vienna University Hospital and the intensive cooperation with their top-level researchers and clinicians, contribute to the fact that patients at Wiener Privatklinik are treated with the best and latest methods. We are also aware of the importance of our patients’ well-being and are dedicated to offer them an environment which is not only luxurious, but also creates the atmosphere of safety and comfort, thus contributing to patient healing process. Of course, that includes the highest degree of confidentially and discretion. From the first patient´s contact with WPK, to the aftercare and follow-up, we provide them with high quality, sustainable care. What are the leading medical services are you offering today? — First duty to the patients is to offer them an excellent medical expertise in an atmosphere of safety and comfort. Wiener Privatklinik is renowned for its successes in the fields of internal medicine, oncology (WPK Academy Cancer Centre), trauma surgery, sports surgery and orthopaedics, cardiovascular diseases, gastroenterology, general surgery and general diagnostic. For an example, at our Academy Cancer Centre we offer a whole range of cancer treatments, from chemo therapy to the latest immune therapy and surgery. We are in the process of building the modern state-of-the-art radio therapy centre. Of course, we are also offering the best diagnostics, including lab tests, PET scans, MRI, biopsy tests etc. What international patients can expect from you? — Our distinctive features are a combination of the latest treatments combined and the highest diagnostic standards, plus the top notch medical devices, techniques and physicians with the highest international reputation. But I would like also to point out that our marketing and international department, which is constantly growing in response to the growing patient’s requests, help patients with arranging appointments, issuing cost estimates, assistance with visa invitations, organizing ambulance transport, etc. We provide all these services in different languages besides German, such as English, Russian, and Romanian. It seems that you have strong international connections and lot of international patients. — We are very proud that the international patients have recognized what we represent and that we have gained their trust. The number of international patients is growing and we are becoming increasingly known for our services internationally. We are very happy and pleased to be able to offer our patients the best possible service and care. We also visit and stage events in different countries such as Romania, Russia and others, replying to public and media’s questions about WPK, but also offering second opinions, or answering patient’s questions. During the selected exhibitions we attend, mostly in Russia and Ukraine, we publicly present our clinic, as well as present ourselves to potential cooperation partners, all with the view of building stronger connections abroad. We are also very proud to say that we have a WPK Office in Bucharest and Timisoara, as a result of the increased interest from patients in Romania, where patients can visit us directly during our working hours, or contact us over an e-mail or phone, and have their questions regarding appointments, cost estimations and other things answered. To book an appointment all you need to do is to send an e-mail at info@wpk.at, or to call us on +43 1 40 180 8700. Our international marketing department will answer any questions you might have.